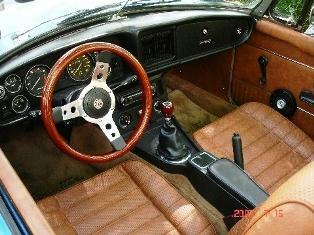 Here are some photos of my recently, completed 1979 MGB. The engine has been detoxed and upgraded. It is bored out 40 thousandths; new parts include: stock cam, pistons and valve train, 2 bbl Webber downdraft carburetor, exhaust header, alternator, Petronix ignition, radiator, valve cover, water pump, fuel pump and gas tank. The suspension has all new Urethane bushings and a Monroe shock at each corner. The interior is all new done in Autumn Leaf with ealier chrome stripped door panels. The front tag was given to me by a patient from England. This car was left for trash in a backyard in Tampa Florida, full of leaves, wasps, ants and rats had nested in the driver’s seat. It was ready to go to the junk yard. The engine was left exposed with the spark plugs removed. It has taken a year and a half to get it back into running condition. The only major work left is a little body work and a new paint job, probably Brooklands Green. Thanks to Glenn’s MG in St. Petersburg for the engine rebuild and Victoria British and Moss for all the parts and The Roadster factory for the interior and carpet kits. My wife is happy that it’s almost done because I have spent many hours in the garage with my little MG. I still sneak into the garage and rub her headlights every once in a while just to make my wife jealous, especially now during rainy season when we can go out for a ride.